This is a great summary of the best of Freo that appeared in the Sydney Morning Herald and the Canberra Times. I had the pleasure of meeting Mal when he was here and great to see he had a good time. 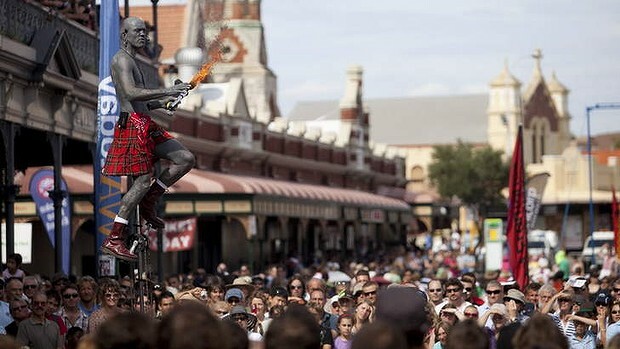 The Street Arts Festival is a West Australia staple. This annual Easter knees-up has become a WA staple and is a great time to visit Fremantle. Renowned performers from all over the world descend on the port city to juggle, sing, dance, tumble and entertain the masses. And the masses turn up too, with more than 110,000 visitors chucking coins in hats over four days at the mostly free shows. This is busker ground zero and imaginative (and often bizarre) acts keep the crowds laughing and bring a collective smile to the whole town. See fremantle.wa.gov.au/festivals/Street_Arts_Festival. Little Creatures is just one of the lures of the iconic working harbour. With plenty of restaurants from fish and chips (Cicerello’s is a staple) to fine seafood dining, cafes and bars along the boardwalk, the harbour is always pumping. Festivals dominate the calendar, including the Sardine Festival in January, Chilli Festival in March, Blues and Roots Festival in April and the Blessing of the Fleet in October. And don’t miss the Maritime Museum Shipwreck Gallery, housing artefacts from the litany of victims of WA’s treacherous coastline. See fremantlefishingboatharbour.com. The spiritual home of the successful 1983 America’s Cup challenge and the venue for the defence of the Auld Mug, Fremantle’s consistent high winds make it a great spot to get a brackish taste of ocean sailing. The afternoon sea breeze (known as the Fremantle Doctor to everyone not from WA, for some reason) ensures a hardy workout for boats and crews. A more genteel excursion is available on the Swan River where all manner of craft crisscross the shallow expanses. The slogan on West Coast Jet’s 16-seater jet boat is “Wetta iz betta” and you are warned that “You may get wet”. Adhering to the business principle that it’s better to under-promise and over-deliver, the powerful craft thumps through the waves and wakes of approaching fishing vessels in a thrill-ride that shakes your teeth and deluges you in sheets of briny Indian Ocean. Okey Dokey is a hoot. Don’t miss it. And when they ask you if you want to put your stuff in dry storage, say yes. See westcoastjet.com.au. The John Butler Trio, San Cisco, Eskimo Joe and The Waifs are a just few Freo musos to have made a national impact. Freo has always been a magnet for avant-garde musicians and artists and the lamp posts are coated with posters advertising upcoming gigs. Buskers are everywhere and there are plenty of music clubs and live venues to choose from – check out Fly by Night club and Kulcha. They have their own symphony orchestra and the Hidden Treasures winter music festival in July pulls big numbers. Just wander in to get a lesson in the ancient instrument from some of the coolest barefoot dudes imaginable. There’s always a backpacker or two trying their hand at the exotic art of circular breathing (just $30 for a one-hour lesson) and it’s amazing how a bit of expert tuition can get you going. They claim the “planet’s largest selection of didgeridoos” plus other unusual world musical instruments and a range of didge-related paraphernalia. Seedidgeridoobreath.com. Wander the fascinating alternative gallery and then dine at Canvas cafe and hear local and touring artists make beautiful music in a lovely courtyard surrounded by huge plane trees. Performances are held from October to March and there is no better place to wile away a couple of hours on a sunny Sunday afternoon. The attitude is very relaxed and you can bring your own picnic lunch if you like. The free concerts are very popular so go early. Seefac.org.au. Affordable rents and an artisan attitude have created this brazenly funky precinct. You’ll find something no one else in Sydney is wearing among the unique outfits, jewellery and accessories at Love in Tokyo and the other groovy boutiques. There’s fine art with a difference at Merenda and Japingka galleries and colourful Indian fabrics and curios at Kartique. Take a break at the “very Freo” New Edition bookshop, incorporating the Grumpy Sailor Cafe and a fashion designer in the rear. Two Feet and a Heartbeat operate a walking tour of the city and the engaging guides add plenty of anecdotes, especially the macabre tales of life in – and escapes from – the Fremantle Prison. The tour goes off the main drags and includes a couple of kooky galleries and the oldest building in Western Australia, The Roundhouse. The tour lasts two hours and costs $40 or just $20 on “Tight Arse Tuesdays”. twofeet.com.au. Eleven self-guided walking trail maps are available at fremantlewa.com.au/pages/fremantle-walking-trails. Renowned Portuguese artist Alexandre Farto (aka Vhils) has chiselled into the wall of the Norfolk Hotel a quite brilliant “sculpture” portrait of Australia’s first female senator, Dorothy Tangney. Vhils’ unusual technique fits the Freo street art model snugly. An eclectic graffiti policy means an arts committee decides whether “installations” have artistic merit. Other pieces not to be missed include the huge numbat on the Old Spice Building, the zebra on South Terrace and the boxing kangaroo on the side of the National Hotel. The fresh seafood, nearby market gardens, European influences and eclectic tastes of Fremantle have spawned a diverse range of excellent restaurants. For a spicy fusion experience, go to Barque on George Street and try the ginger vegetables. Also on George Street and a good place for both breakfast and dinner is The Wine Store, while the newly opened Bib & Tucker on Leighton Beach Boulevard is getting rave reviews. The European-styled and vegan-friendly Harvest in a little cottage in Harvest Road has been offering a top-end avant-garde menu for years. The true-to-name Raw Kitchen on South Terrace (lunch only) will arrange your uncooked selections in a way you’ve never seen before. Try Ootong & Lincoln cafe on South Terrace for breakfast or a burger or rub shoulders with local nonnas and stock your Italian pantry at Galati & Sons deli in Wray Street. If you like your salads with tempeh, tofu, nuts, seeds and legumes, Manna Wholefoods cafe is the place for you. They even have their own naturopath. Melbourne-esque small bars are popping up in Freo and more are planned. Whisper Wine Bar in Essex Street is one such new addition and has a cosy and friendly vibe. Who’s Your Mumma on Wray Ave is run by the Harvest Restaurant people and is more upmarket than its name might suggest. Mrs Brown in Queen Victoria Street is a retro gem and you can bring in your hamburger from Flipside next door. For themed music nights, head to Mojo Bar in Queen Victoria Street. The “cappuccino strip” has long been touted as the go-to place for your morning java but in truth it’s getting a bit old, although there are still a few lovely venues. For a more modern and Freo-funky experience check out the Middle Eastern-themed Attic in Bannister Street, Moore & Moore cafe (and art gallery) in Henry Street, Hush Espresso in Market Street and Chalky’s Espresso Bar in High Street, which also has offers a huge range of teas, juices and meals. But really, it’s almost impossible to get a bad cuppa in Freo. Bicycle tracks are everywhere and there is brisk trade in recycled bikes too. Take a casual pedal past the cranes of the working harbour, get your morning coffee at Tasty Express @ B Shed cafe and then head down to the beach or along the 10-kilometre Fremantle Heritage Trail. If you fancy a decent hit out, you can cycle for 55 kilometres right along the sunset coast on dedicated cycle paths north from Fremantle to Burns Beach. Free bike hire from the Fremantle Visitor Centre in Kings Square. Monument Hill is an ideal place to take in one of WA’s spectacular ochre sunsets and is perfect for an evening picnic, if the sea breeze is not howling. Named for the war memorial at the top of the peaceful grassy hill, the views of the harbour, the city and the ocean are amazing and are best viewed over the rim of a glass of something special from Margaret River. The heritage-listed gaol has a long, brutal and fascinating history. Built in the 1850s and decommissioned in 1991, it is now one of Fremantle’s chief tourist attractions and there are five different tours to choose from, starting at $19 for adults. On the Tunnels Tour ($60) you descend a 20-metre ladder and walk through the underground labyrinth before paddling a replica convict punt through the submerged passageways. See fremantleprison.com.au. AC/DC front man Bon Scott lived in Fremantle as a youngster and this kitschy limo tour visits his haunts and pays tribute to the rock icon. Starting at the bronze statue of Bon near Fishing Boat Harbour the two-hour tour takes in a Bon mural under the Stirling Traffic Bridge and ends at his gravesite at Fremantle Cemetery. One for the true black, rusted on Acca Dacca fans. Tours by booking only, $200 for four or fewer, $300 for six. Seesunsetcoastlimos.com/highway-to-hell-tour-freo. The comparison may not be immediately apparent but there are plenty of similarities – a working harbour, sailboats aplenty, heritage buildings, a progressive bike-loving mayor, superb coffee and excellent restaurants with water views. On a sunny weekend Freo is Newtown meets The Rocks with a seaside holiday town vibe. Fremantle’s community spirit is a force of nature – whether it be an important planning decision or simply saving a tree. An estimated 40,000 Dockers fans commiserating at a post-grand final street party on Fremantle’s streets have been largely peaceful and law abiding, according to the city’s Mayor. Fans watched on big screen as their team’s captain, Matthew Pavlich, led his teammates in a match against Hawthorn at the MCG today. Despite the team’s loss, the vibe remained upbeat as many stayed to party in the city centre, closed to vehicle traffic for the occasion. It was the biggest day of festivities Fremantle had seen since the Australia II’s America’s Cup win almost 30 years ago to the day, Mayor Brad Pettitt said. “It was spectacular, it made me really proud of Fremantle,” Mr Pettitt said. Pubs and restaurants did a bustling trade with punters at some venues queuing for an hour before they could get inside for a beer. People crowded the windows outside some venues trying to catch a glimpse of the screens as they steamed up from the crush of people inside. The largely calm celebrations were briefly marred as some people were ejected from the Sail and Anchor tavern, and two young men were taken into custody by police. Liquor licensing authorities closed down the bar’s balcony after reports of people tipping beer and flicking cigarette butts at people’s heads. Beer stocks were hammered at taverns across the city but Sail and Anchor manager Pete Bottcher said theirs should last through the weekend. At the Old Shanghai food court, one stall holder said she had ordered in more food in preparation for the post-match festivities. “Because now I think business in Fremantle has not been so good, but because there’s something special, I think all the businesses are expecting (it to pick up),” said the stall holder, who asked not to be named. Die-hard fan Kevin Croon, 68, said he was happy he watched the match with other fans. “Fremantle’s a very local place, we’re a great local community,” he said. Amazing day to be in Freo. 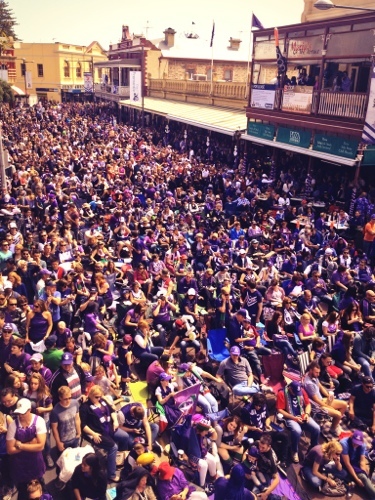 I can honestly it was the biggest, busiest, most purple day in Freo in my lifetime. Well done to the whole City of Fremantle team and everyone who got behind the dockers. 25 games to the next Fremantle grand final party. It is going to be a big day. Four screens, kid zones, and lots of Freo fun. I’ll see you in there. Check out last night’s fantastic Australia-wide 7.30 Report. Nineteen years after entering the competition, the Fremantle Dockers will play their first AFL Grand Final and finals fever is sweeping the Western Australian city. LEIGH SALES, PRESENTER: In the 19 years since the Fremantle Dockers first entered the national AFL competition, the Premiership Cup has been an elusive dream. The hopes of diehard fans were dashed season after season. But this could be the year that Fremantle finds glory, as the sentimental underdogs tackle the favourites, Hawthorn, in Saturday’s Grand Final. Claire Moodie has the story. CLAIRE MOODIE, REPORTER: The port city of Fremantle has always been colourful, but never moreso than right now. BRAD PETTITT, FREMANTLE MAYOR: No, it’s not over the top. I think more. I think it’s looking pretty purple now, but by Saturday, it’s gonna be absolutely crazy. CLAIRE MOODIE: To understand the euphoria, you have to understand the history, the history of a football team and its spiritual home. FAN: 20 years waiting for this moment. It’s really – touches the heart. CLAIRE MOODIE: After 19 years in the AFL, finally the moment Dockers fans have hung in there for. LES EVERETT, WRITER: There was this nagging feeling that, you know, for some of us, it might be not in our lifetime. GERARD NEESHAM, FREMANTLE COACH, 1995-’98: I think they’ve got a fantastic chance. I think I would nearly start ’em if I was the bookies equal odds because they comprehensively beat Geelong down in Geelong and they demolished, forget the scoreboard, they demolished Sydney. CLAIRE MOODIE: Gerard Neesham was the Dockers inaugural coach in the mid-’90s. Like others, he attributes much of the club’s current success to the leadership of Ross Lyon. GERARD NEESHAM: Everyone’s prepared to play to the game plan. They’ve totally committed to it. They are ferocious tacklers. Even the littlest fellas are. CLAIRE MOODIE: But it’s been a rocky road to the top. As recently as 2009, the club ended up 14th on the ladder. LES EVERETT: There’s a stoicism about us that we keep with it. There’s probably a sense of humour, a bit of – in some of the dark times. CLAIRE MOODIE: Putting the finishing touches to a book on the club’s history, Les Everett remembers the highs and lows, including the sacking of former coach Mark Harvey. He says Harvey should be given credit for his part in building up the strength of today’s team. LES EVERETT: What had happened around then is that they – the club decided on a new list management style which meant not trading in the established players, but going to the draft, and so that’s when this great squad was started to be built up. CLAIRE MOODIE: Les Everett also remembers the early days when one of football’s most intense rivalries was born. LES EVERETT: The Eagles were a great team when Fremantle came into the competition and almost treated Fremantle with disdain. CLAIRE MOODIE: Today the dynamics have changed, but not enough for most Dockers fans. LES EVERETT: The West Coast supporters always have that thing they can say: “You haven’t won a premiership. We’ve won three. You’ve got nothing, etc.” And, they do. CLAIRE MOODIE: Making the most of the Dockers’ dream run is the club’s hometown of Fremantle. It’s been suffering a downturn in recent years with shops and businesses closing. CHRIS LEWIS: On Saturday night I caught the train back from Subi’ at about 9.30 or something. 1,000 people got off the train, walked out in unison, waving, cheering, across the pedestrian crossing, through the traffic and walked straight down South Terrace and the good will was enormous. Horns blowing, people cheering. CLAIRE MOODIE: 30 years ago the America’s Cup win prompted millions of dollars of investment in Fremantle’s historic buildings. Locals hope the Dockers’ exposure will put the port city back on the map. BRAD PETTITT: You have this feeling in the air that this is almost the start of a new renaissance for Fremantle, perhaps the first since the America’s Cup. CLAIRE MOODIE: This is a town with a proud history and now a football team in the running for Australia’s ultimate sporting prize. The Dockers’ success is likely to kickstart a push to keep the club in Freo. These diehard fans are part of a group set up to stop the club moving its HQ away from its historic base at Fremantle Oval to a brand new facility in Coburn, 15 kilometres away. CHRIS LEWIS: The Dockers just fit into Fremantle. They’re called Fremantle, they’re part of Fremantle. Fremantle can really wrap around the Dockers. It has done for 20 years. The Dockers are winning while they’re based in Fremantle right now; they can keep doing it for another hundred years. CLAIRE MOODIE: Gerard Neesham grew up in Fremantle and understands the passion locals have for their club. GERARD NEESHAM: I much prefer them to stay with the original colours in Fremantle, so that’s me. But having said that, if I had my way, I just wished they’d win on Saturday. CLAIRE MOODIE: As thousands of Dockers fans flood into Melbourne like a purple tsunami, in Fremantle, civic leaders are preparing for what they’re calling the next best option. BRAD PETTITT: We’re gonna close down the cappuccino strip, put up two huge screens, and so whole families can come down, bring a rug, watch the game. CLAIRE MOODIE: And the excitement is building by the day. FAN II: I mean, it’s massive for Fremantle. It’s the Fremantle Football Club; it’s that simple. GERARD NEESHAM: Hawthorn could win by 30 or 40 points, but I think that they are gonna run into something that’s gonna be very hard to beat. That’s my sense and I’ll be barracking for Freo. FAN III: A win, by this much (indicates small amount with fingers) or this much (indicates larger amount with fingers), it doesn’t matter. CLAIRE MOODIE: Can you do it? CHRIS LEWIS: We would like to see the cup sitting there on a big plinth above South Terrace, just there. Perfect. LEIGH SALES: Claire Moodie reporting.